Coffee Break. 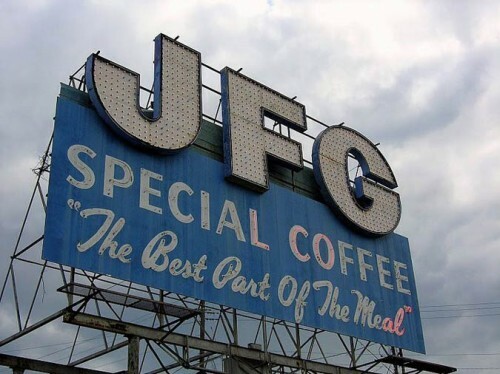 A fourteen-foot tall neon sign that has been removed from the Knoxville, TN skyline after 50 years is undergoing restoration but needs a new home. Preservation magazine has the story and Knox Heritage has more info on their sign restoration program. Urban Immobility Report? Greater Greater Washington has an update on the controversy of a major traffic congestion report released each year the Texas Transportation Institute (TTI) called the Urban Mobility Report (UMR). Last year, CEOs for Cities published a critical analysis of the UMR called Driven Apart pointing out its false conclusions that can distort the congestion level based on the sprawl levels. How will it impact the future of transportation funding in the U.S.? Street Presence. Should urban buildings should put their best face forward? Pointing to a rather uninspiring St. Louis building from the 1980s with its back turned to downtown streets, Urban Review STL argues that a certain level of sidewalk interaction, whether that be storefronts, entrances, or simply windows, should be required through zoning for a more vibrant urban experience. Portlandia? Did you catch the premiere of IFC’s new sketch comedy flick Portlandia over the weekend? While it’s not quite so much about architecture, it does parody the city that has helped to transform the idea of bikability and the future of the American city. The Oregonian has a roundup of reviews from across the country and Bike Portland has a clip of an upcoming sketch about bike messengers.